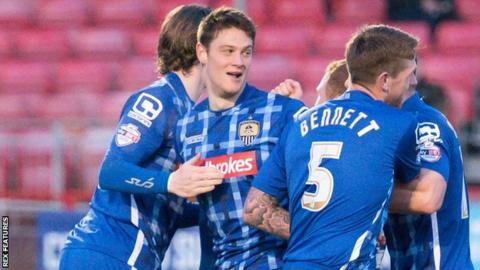 Notts County winger Filip Valencic says he was "surprised" not to play more games under former boss Ricardo Moniz. The 24-year-old joined County in July, but made only two appearances in League Two before Moniz left in December. The Slovenian scored the only goal as the Magpies won at Crawley on Saturday in their first match since new manager Jamie Fullarton took charge. "With that shot I put all my anger in it because I didn't play," he told BBC Radio Nottingham. "I thought I would be playing more, not every game, but I really thought I would be paying more. "I have spoken with Ricardo a couple of times and basically what he told me was that I'm not ready for the first team so I kept playing for the reserves and waiting for an opportunity. "When the new manager came he gave me the chance and I took it."